Recently, Supreme Court Justice Stacey Bennett sitting in a Matrimonial Part in Nassau County made a decision in an unusual case. A husband started a divorce lawsuit. He was granted a judgment of divorce in this proceeding. Both parties after the divorce were to submit post trial briefs to the court regarding all outstanding economic issues. Then, the husband committed suicide. The wife claimed suicide didn’t stop the divorce action from going forward because the judgement had already been rendered. 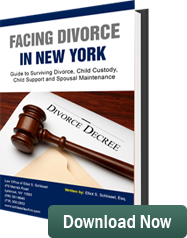 The husband, a physician, in an attempt to deny his wife and children equitable distribution of millions of dollars in assets and life insurance that he possessed, decided to kill himself. At the time the husband committed suicide he was aware he had advanced brain cancer and did not have a significant time to live. Prior to committing suicide the husband changed the beneficiaries on his $2,000,000 life insurance policy and $3,000,000 in his investment accounts. In violation of the court’s order he changed the beneficiaries from his wife and their son and named his mother, who is the executrix of his estate, and his sister as beneficiaries. The suicide took place after each of the parties had rested their presentation to the court but before a final judgment had been entered. The legal question presented was whether the suicide abated the divorce (stopped it from moving forward) and prevented the Supreme Court Judge handling the case from making a decision on equitable distribution of the assets. The husband’s attorney claimed the case needed to be dismissed because the husband was dead. The dismissal of the case after one of the parties dies is called abatement. However, Justice Stacey Bennett said this case didn’t abate because the divorce had been granted already. Justice Bennett’s decision was that she still had jurisdiction to finalize all the remaining economic and financial issues in this divorce proceeding even though the husband died before equitable distribution took place. Justice Bennett took the position the entry of the divorce itself was merely a ministerial act. The case was to continue even after the husband’s death on the issue of equitable distribution.